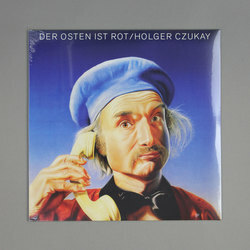 Holger Czukay - Der Osten Ist Rot. Vinyl LP. Bleep. Herbert Groenemeyer’s Groenland Records are currently reissuing several key works from Holger Czukay’s back catalogue. 1984’s Der Osten ist Rot (The East Is Red) is one of the LPs to make the cut. Well-received on release (it placed on the NME’s ‘Albums Of The Year’ list for 1984), the ten tunes here the sort of stark experimentalism that placed Czukay alongside the likes of Captain Beefheart and Frank Zappa in the pantheon of rock’s great innovators. Everything from rap to doo-wop to music concrete is given the Czukay twist here.